The two draperRacing riders Aaron Clarke and Tommy Philp will travel down to Kent for the second round of their respective championships when the British Supersport and National Superstock 600 races take place on the short and technical Indy circuit at Brands Hatch on April 15. Both riders found success at a cold and wet Donington Park in the opening round of their championships and will be hoping for more of the same this weekend, but in better weather conditions. East Kirkby’s Philp has come on in leaps and bounds over the past year, and straight from the off at Donington he was recording fast laps and up at the sharp end of the field. He secured a sixth and seventh place in his two British Supersport races and he too will be chasing more of the same at Brands Hatch. 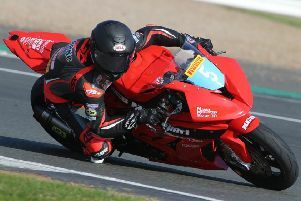 Teammate Clarke, from Kirton, recorded a strong sixth place in the first round of the stock 600 series two weeks ago. This has filled him full of confidence to replicate this result in the Brands Hatch race on Sunday. Superstock 600: Friday - free practice one 9am; free practice two 1.30am; Saturday - qualifying 12.25pm; Sunday - warm-up 10.10am; race (22 laps) 11.35am. British Supersport: Friday - free practice one 9.30am; free practice two 2pm; Saturday - qualifying 11.05am; sprint race (19 lasp) 5.10pm; Sunday - warm-up 11.13am; feature race (26 laps) 3.35pm.